With so many beautiful hiking trails in Crested Butte, it`s hard to pick a favorite! Here`s a helpful guide that will help you see the best of the Elk Mountains. Since 1983, CBMBA has been creating, maintaining, advocating, and putting mad love into over 450 miles of single track in the North end of the Gunnison Valley. Crested Butte is one of the founding homes of Mountain Biking. CBMR`s Bike Park offers the some of the best trail riding in the Gunnison Valley. Learn more about the wide variety of lift ticket options available for your trip. From multi day to half day options, you can find something to fit your needs perfectly. Big Al`s Bicycle Heaven is the place to go for all your rental, repair, and 2 wheel needs! Take in a different view of Crested Butte on Fantasy Ranch horseback riding trip. They specialize in trail rides on Snodgrass Mountain, but also organize overnight trips. Rafting and Kayaking trips are available for all levels of adventure on the Gunnison and Taylor Rivers. Scenic River Tours, located in Gunnison, Colorado, offers guided rafting, fishing, rock climbing, inflatable kayaks, zip-lining and much more! Crested Butte Angler guide service is comprised of professional guides who are dedicated to creating environments that lead to success for our clients. We offer the highest quality experience for all levels of anglers. We welcome all to enjoy our menu of fishing opportunities. The Gunnison/Crested Butte area offers fly-fishing variety beyond compare. Large rivers, small backcountry streams, wading or float fishing, you can pursue four great trout species. If you are very fortunate you may catch a rainbow, brown, cutthroat and brook trout all in the same day of fishing. 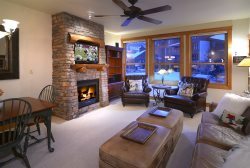 The Club at Crested Butte has a tradition of excellence in teaching by our Professional Staff. We have no doubt that you will enjoy the game more if you play to your potential. CB SUP is Crested Butte`s premier SUP rental and lesson outfitter. We exclusively rent and teach lessons on SOL Paddleboards from Telluride, CO and are PaddleFit Level 2 certified. CB Motorsports, Inc. rents snowmobiles and ATVs that are new and maintained in excellent condition so that you can access the backcountry and see the views of a lifetime - and have fun doing it! Explore off-road trails and mining roads dating back to the 1800s. There are over 2,000 miles of ATV, jeep, and 4-wheel drive trails in the Gunnison Basin, which provide access to spectacular mountain scenery, aspen forests, diverse landscapes, wildlife, rivers and creeks, and ghost towns. CB South Fitness is a local gym located at 310 Elcho Ave, Crested Butte (in the CB South commercial district). Offers include strength and cardio equipment, easy key card entry, and convenient hours from 5am 10pm.